This was original posted to Royce Kimmons's blog [https://edtechbooks.org/-GgP] on February 2, 2011. Building off of Matthew Might’s illustrated guide to a PhD [https://edtechbooks.org/-Gmb] and sparked by some concepts presented in Roberts’s The Dissertation Journey, I’ve been pondering lately the scope of human knowledge, scientific progress, and distributed cognition as they relate to seeking a PhD in today’s world. Let’s start by creating a two-dimensional model of human knowledge c. 300BC. At that time, Aristotle was alive, doing the whole philosopher thing, in Athens and thereabouts. As with any learner of any age, Aristotle had access to knowledge resources (e.g. other people [Plato], written records, etc.) and had the ability to engage with these resources, which we will call literacies. As the model suggests, though Aristotle was a well-learned individual, he certainly did not know all that was known by humans throughout the world. On the other hand, he was able to push and grow human knowledge in a few, key ways (e.g. ethics, astronomy, etc.) as evidenced by the manner in which his knowledge (at points) reached the edge of human knowledge and expanded it. 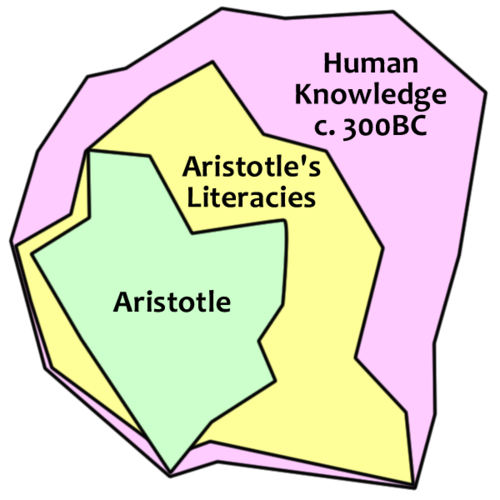 Additionally, Aristotle had access to knowledge resources and had the literacies necessary to use them, which expanded his ability to utilize human knowledge. That is, though Aristotle learned much, he still relied on external sources of knowledge (e.g. star charts, histories, maps, etc.). Let’s contrast this with a fictional unlearned peasant of the time named Philo. You’ll notice a few differences between Aristotle and Philo. 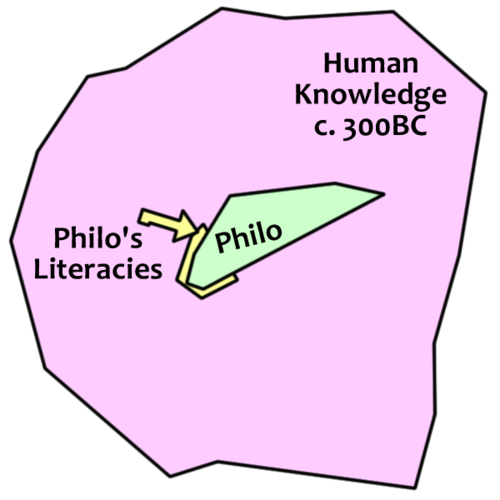 First, Philo knows considerably less (as illustrated by the smaller size of his polygon) than Aristotle. Second, there are some things in which Philo is more learned than Aristotle (as illustrated by the sharp point on the right which more closely approaches the limits of human knowledge than Aristotle’s) in certain subjects (e.g. tilling land, pruning, etc.). And, you’ll also notice that Philo’s literacies are such that he cannot come close to matching Aristotle in some aspects, even while employing all the resources at his disposal. Now, consider Jo, a 21st century PhD candidate. You will notice a few things in this illustration. First, at least the shape of human knowledge has changed from how it existed two millennia ago (while whether or not the scale has changed depends upon your belief in scientific progress). 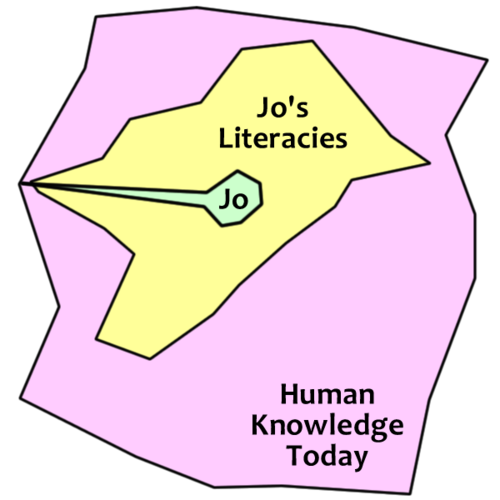 Second, Jo, like Aristotle, is pushing the limits of human knowledge in at least one key area which he has devoted his time and energies to researching. Third, in shape, Jo looks much more like the peasant Philo than like Aristotle (i.e. he is a master of one aspect of human knowledge and is largely ignorant of others). And fourth, like Aristotle, his literacies allow him the ability to utilize a wide range of resources beyond himself, even outside his expertise area (e.g. Internet resources, library materials, friends and acquantances in different careers and academic areas, etc.). Now, if these are at all meaningful models of these three individuals’ knowledge, then what does this mean for the budding PhD candidate? First, it raises concerns for the ivory tower approach to education and research that persists in our society, because Jo, like the unlearned peasant of two millennia ago, is, himself, only skilled in a single way of thinking and working. He may not, for instance, be able to bring himself to think about problems and issues in the world around him in non-academic or non-disciplinary ways. (To a devout businessman, aren’t all occurrences business opportunities? To a devout researcher, aren’t all happenings fodder for research?) In fact, he may not even be able to effectively communicate with those of different educational levels or research interests (cf. Deresiewicz [https://edtechbooks.org/-mam]). Second, it forces us to come to grips with the value of distributed cognition. If, in fact, all of human knowledge is not knowable by a single individual and if, in fact, an individual must devote his energies entirely to a single facet of knowledge to push the limits of human knowledge one millimeter further than it currently is, then, it follows, that to grow human knowledge, individuals need some level of support in areas outside their expertise area in order to function in a world that requires at least a certain level of general or communal knowledge. As such, we may find value in considering how distributed cognition (including technological tools which serve as aides to human understanding and social connections with experts in other areas [including more general knowledge areas]) can empower us to simultaneously be effective researchers (or growers of human knowledge) and well-rounded people with the fundamental knowledge necessary to act and prosper in a world that is continually being reshaped in a variety of directions.